Russia is well known not only for its huge resources of solid fuel but also for its large heat reserves. 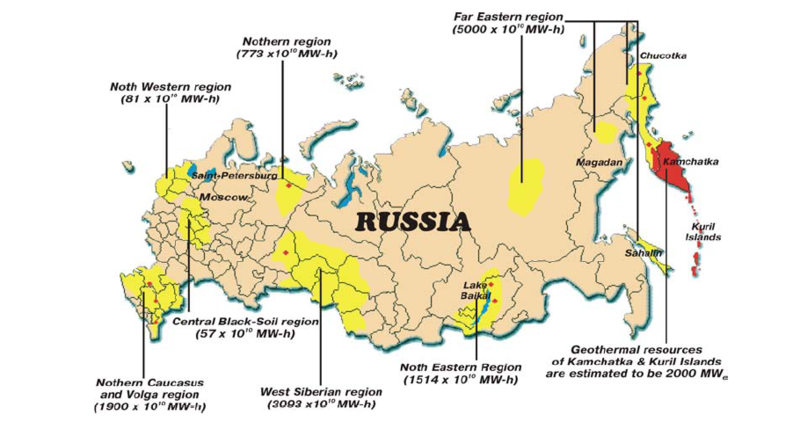 Heat reserves with the temperature of between 30-40 0Ñ can be found in several regions of Russia and some parts of it are known for geothermal reserves with the temperature of up to 300 0C. The territory of Russia is well investigated and major heat resources have been already discovered, having large industrial and generating power capacity. Geothermal resources with temperatures above 20-25°C may be considered promising and profitable for energy supply of some remote regions and national housing sector because today there are heat pumps and systems that produce heat carriers with temperatures of 80-90°C and above. Therefore, geothermal energy may be effectively used for heat supply of cities, settlements and standalone complexes on 75-80% of the total Russian territory. Over 3 000 wells have been drilled in Russia in order to take advantage of its geothermal resources. In 1983 a map of thermal water resources of USSR was prepared. Forty seven geothermal fields with the capacity over 240õ103 ì3/day and two-phase fluid fields with the capacity 105õ103 ì3/day had been explored on the territory of Russia.